What to look for in a Robotics Workshop? School Education today encompasses a variety of tools, workshops and learning techniques to impart the vision of all-round development and overall enhancement of analytical, thinking and critical skills in students. 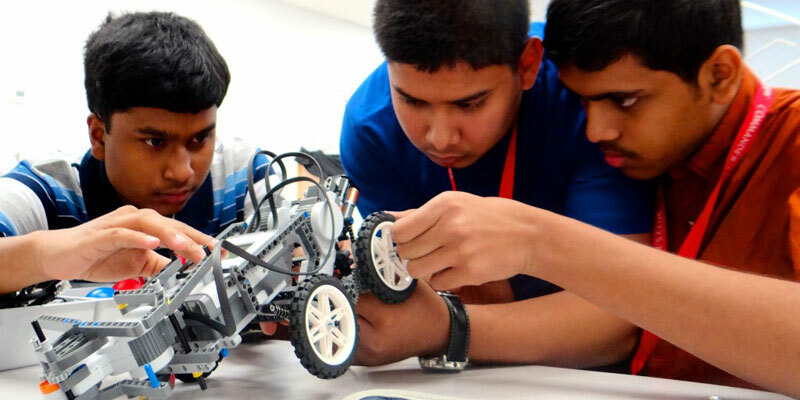 There are many clubs running in schools for this purpose and one of the most successful learning tools has been imparting Robotics workshop to students in school. A Robotics workshop is not just about creating Robots or making things that can move through a remote control. These workshops use the Robots as an exciting tool to deliver many key concepts and learning outcomes of the education curriculum. Let us have a look at some of these aspects of a robotics workshop. A robotics workshop works on the concept of STEM education (Science, Engineering, Technology, Maths). STEM education encourages a hands-on learning approach in an interdisciplinary and applied format. Students understand various topics from the real worlds as concepts not of any individual subject but as a cohesive, integrated learning approach. A Robotics workshop uses Robots to teach the concepts of electronics and electricity to students. They also learn about the mechanics by the way of the motion of robots and different parts of it. This also makes way for the learning of various physical and mathematical concepts. Students learn various subjects not from books or even through guided activities, but by designing their own Robots. A good robotics workshop should follow the maker’s approach and students should be developing their own models through their own hands. Students should be given projects where they need to identify solutions to problems that present themselves during the course of the project. This encourages problem-solving approach amongst students and is a good exercise for developing team dynamics and team building skills as well. One of the major learning outcomes of a robotics workshop should be the development of logic in children. In the growing up formative years of a child, it is the prominent role of education to stimulate a child’s brain with logical as well as artistic things. It gives them a holistic and balanced brain development. Designing a Robot incorporates building the logic behind its design and connecting it to the applications that it needs to perform. Students also use this as a platform to make their robot designs unique which gives them good space to be creative. Computational thinking can be described as a thought process that involves formulating a problem, finding its solution in a logical and algorithmic way, such that any machine or human can carry it out step by step, and, finally effectively executing the solution and evaluating it. Programming encourages one to think in a computational manner such that they can solve problems easily and efficiently. In fact, a robotics workshop using coding and programming can go a long way in developing parts of the brain responsible for memory, concentration and foreign languages, which will further help acquire more skills.